GSMArena team, 09 September, 2015. Another one in a long line of X5 models, the vivo X5Pro is perhaps the most balanced of the bunch. All the others have a defining feature: the X5Max is the thinnest, its Platinum edition has a humongous battery, and even the plain X5 stands out, be it for the wrong reason of having a 720p screen only. Meanwhile the X5Pro sits midway in terms of display diagonal, has an average battery for its size, and the same base hardware - the chipset, RAM and primary camera are shared among them all. Sure, the X5Pro has an 8MP selfie shooter, when the rest make do with just 5MP, but that's hardly a decider. And just when you thought that there's nothing all that special about the X5Pro, you see that its Funtouch OS is built upon Android 5.0.2. The smartphone is the company's only model running Lollipop, the rest of the X5's still stuck on KitKat. Some might think the OS version is just a number, but (spoiler alert!) the X5Pro proved superior to the X5Max in terms of performance, while matching its battery life. We're inclined to attribute a large part of that advantage to Google's newer release (now almost obsolete itself, with 6.0 Marshmallow around the corner). Octa-core Cortex-A53 CPU (4x 1.5GHz plus 4x 1.1GHz), 2GB of RAM, Adreno 405 GPU; Qualcomm Snapdragon 615 chipset. 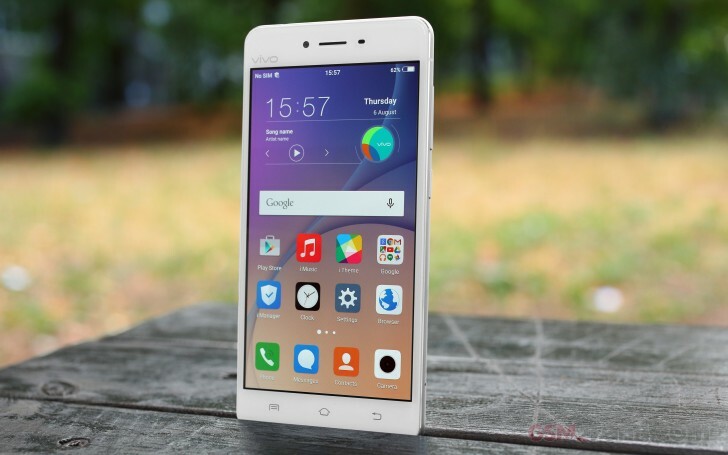 A version with Mediatek MT6752 with 1.7GHz octa-core CPU is also available, but limited to the Chinese market. It should be noted that a Mediatek-powered version is also in existence, relying on the MT6752 chip with a few other differences in hardware and features. It's not meant to leave its home Chinese market though, so we're reviewing the international Snapdragon variant instead. Once we're past the spec sheet and holding it in our hands, the X5Pro has another feature to show off - its dual-glass build. Its metal-clad brethren all have a common styling, which this one doesn't adhere to. But being different from the Max, which we praised for its looks, doesn't make the Pro any less attractive. Well-equipped and good-looking, the X5Pro sounds like a promising package, but let's not rush it. We kick off on the next page with the unboxing and hardware overview.